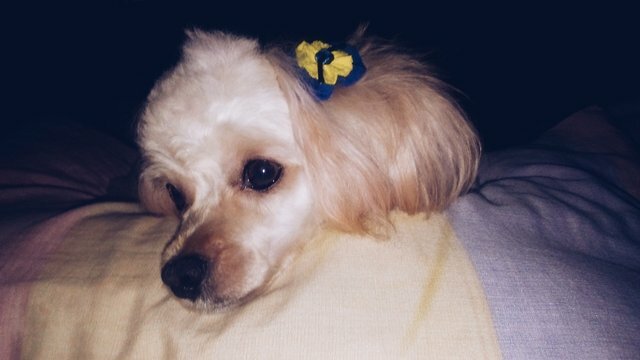 Hi again, here I was about to sleep but they thought I looked pretty and they took this picture. I sleep with my grandmother and this is my favorite pillow. hola de nuevo, aqui estaba a punto de dormir pero pensaron que me veia bonita y tomaron esta foto. Spiked dog collars were used to protect dogs' throats from wolf attacks in ancient Greece. Thanks so much for partaking in dailypetphotography. Please follow @dpet for upcoming events. Our discord channel is up and running, come on over and say hi, lots of avil pet owners are awaiting you there. Congratulations! Thanks for using the #dogsofsteemit hashtag! This post has been chosen as one of the winners for Episode 30 of the #dogsofsteemit challenge. Can't wait to see more dog photos from you!